What to do on a Sunday when hung-over? I guess it would be the easiest to throw it all into a food processor or blender, but I cut it all into tiny pieces with a knife. 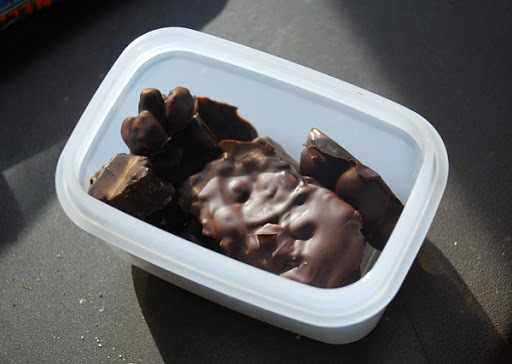 Then I took a plastic wrap and pressed the mixture into shape. Then I melted the chocolate and covered the bars in it. I had some chocolate left so I got out some hazelnuts, raisins (I recently discovered that I don't really hate them anymore, yay!) and dried bananas to cover it with. I also bought new boxes. A small one (picture below), three medium ones for only 5 € and a big lunch box divided into three sections. And now onto the Banana Coffee Cake. 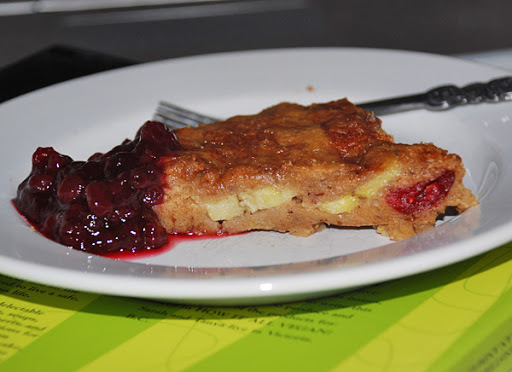 I turned it into a Banana Cranberry Cake because I doubled the recipe before realizing I didn't have enough bananas. 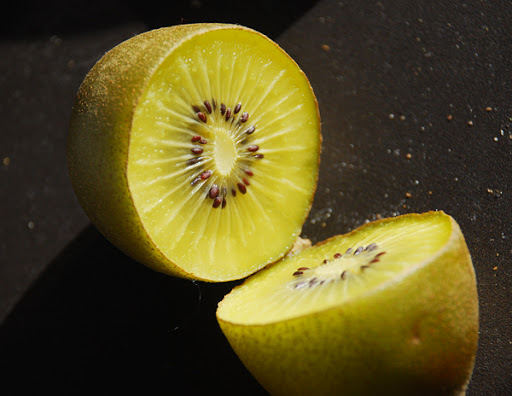 And a picture of a delicious golden kiwi! I get an allergic reaction when I eat regular kiwi, but since the golden ones contain less fruit acid I can eat them without much trouble. Another staple fruit, now that I finally found a store that carries them. Yesterday my boyfriend came over and declared he was hungry. 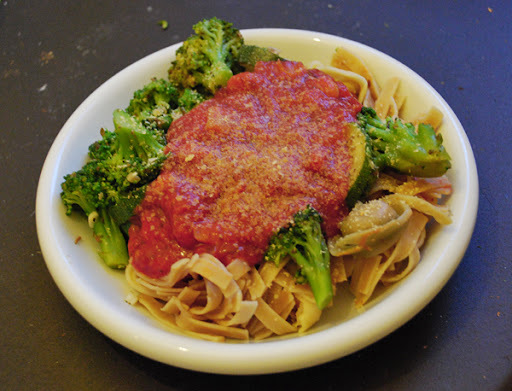 We both had no idea what to make so after checking my cupboards I decided to cook the rest of the Tofu Tortellini, whole-wheat Linguine, garlicky Broccoli & Zucchini to go with it and a ready-to-eat tomato sauce that I pimped with an onion and 1/3 cup baked beans. Yesterday my internet worked again, but when I turned on le big Mac this morning it didn't connect anymore. Wtf? I hate this! I'll try to comment during my break and pray that it'll work again when I come home tonight. Hope you had a nice weekend and a good start into the new week! Ohhhhh my goodness!! LOOK AT THAT CHOCOLATE!!! I might go into sugar shock! You're allergic to the green kiwis, but not the golden ones?? Interesting! I hope you get your internet problem solved soon! I'm so incredibly glad I tried golden kiwis, because after eating a regular one I was indeed a bit scared. Yeah me too! I really don't know what the problem is. One minute it's working and when I get back on after a few hours it's disconnected... I hate computers when they don't work! Topping stuff with nooch is so yummy. Oh, how I love that stuff! 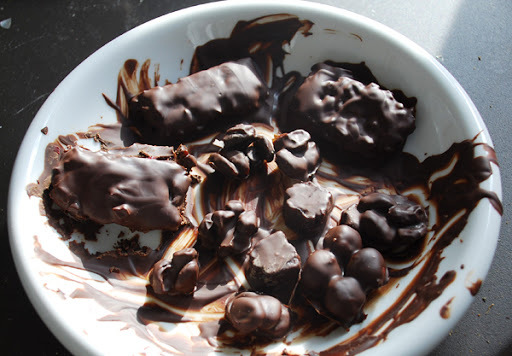 But more importantly: wow, the photos of the chocolate covered bars are phenomenal! They look like they belong in a magazine/top-notch cookbook. And it's a smart idea, too. I think this is the first time I used nooch on top of something (I used it maybe twice since I bought it) and the second I tried it I was like "Now I know why they always rave about it!" ha ha, better late than never! Yummy! 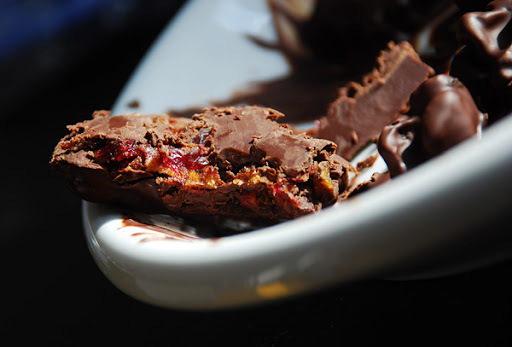 Seriously, fruit covered in chocolate? Where can I sign up? I would have probably made myself sick on it as well. Your dinner looks great. I love just throwing together what you have around. Ha ha, maybe I should come up with more creations and start selling them as the German Lära bar =p But seriously, every time I'm at the organic supermarket I get SO MAD because every single bar I look at has honey in it. I was so furious the last time that I wanted to go up to the staff and say "Why the hell don't you have any vegan bars? You have like 234862374 bars and none of them is vegan. In America they have this and that and you stock up on things vegans can't have!" Hmph, I should do it next time, maybe they'll reconsider it and actually stock up on vegan bars. you just killed me dead with the beauty of that chocolate covered banana thing! Golden kiwis are very delicious! I'm glad you can enjoy them without any difficulties! 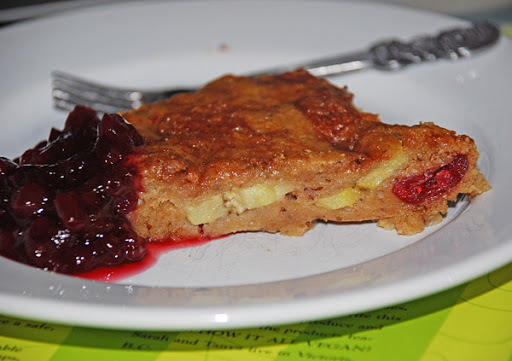 Great job being creative, those desserts looks delicious...I never would of thought of mixing cranberries and bananas. Wow, those bars look absolutely stunning! Umm, did you say chocolate-covered? If it’s chocolate-covered, it sounds good to me! But did you really have to rub it in and tease me with all those gooey chocolatey pictures?! I’ve been wanting to try that coffee cake since seeing it on Ruby Red’s blog, and seeing your version has only heightened my desire for it. Gosh, I wish I liked to cook as much as I like to eat! I’m still looking for golden kiwi. Glad one of us at least found them, even if it isn’t me! 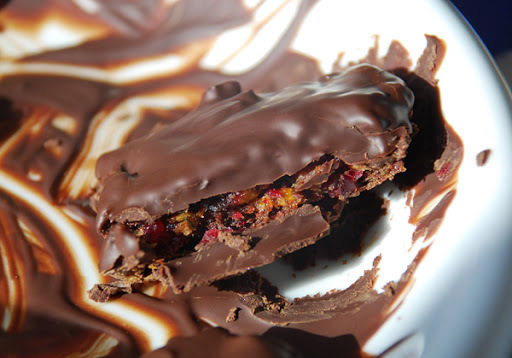 Your banana cranberry chocolate bars look divine! hey i just found your blog!!! I want to swim in that chocolate! fruity - Me too! It'd be a shame if I couldn't eat this delicious fruit. Thanks =) You should definitely try it if you like both fruit, it makes a wonderful combination! Mihl - Thank you =) And believe me, they tasted just as great! Ha ha, I couldn't agree with you more!